President and Chief Scientist, SunDensity, Inc. Forecasts for the global solar industry indicate that the adoption of solar PV generation is spreading at an unprecedented rate. 2018 will be the first year when global solar PV installation will reach 106 gigawatts, making it the first triple digit growth as per the new forecast produced by the GTM research. With the tariffs levied by the US government—while new factories have already been planned out in China and Taiwan anticipating growing American demand over the next five years—this growth will inevitably slow. As shown in Figure 1 below, the revised forecast offers a more conservative projection. 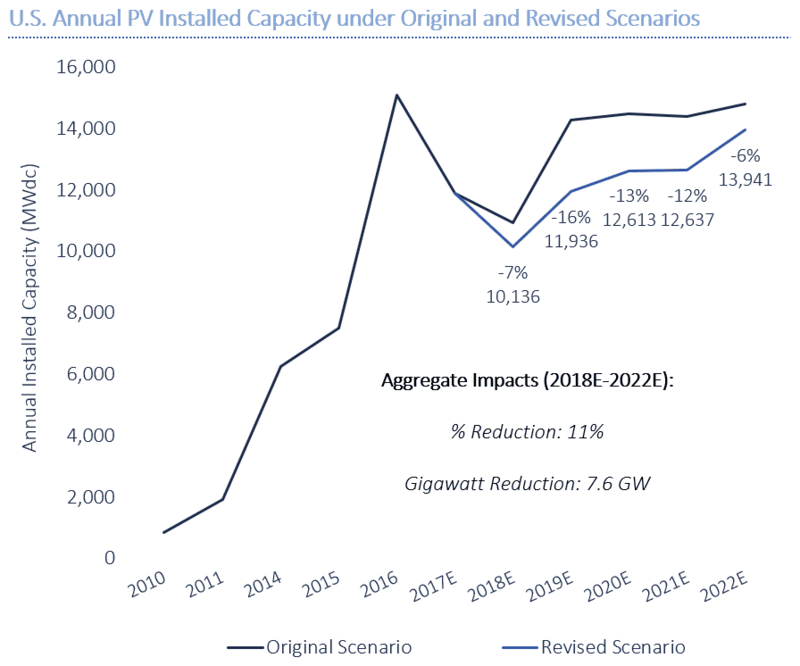 Most restrictive to US solar panel installation capacity will be the significant erosion of US production capacity, which has shifted to China, who is currently responsible for the majority of the world’s solar cell manufacturing. For the US market, where cost of installation is highest, the balance-of-system cost is shown in Figure 2. For the residential sector, the technologies that can reduce the cost of energy on a per module basis will be key to profitability of solar companies. If the price per panel is going up, then the solution must be to make each panel as efficient as possible. At $2.65/watt dc, without solar credits and tax breaks it is hard to make the economic case for solar installation. With the development of Photonic Solar Conversion by SunDensity www.SunDensity.com , the solar industry can overcome this problem. SunDensity’s PSC coating, which can be applied to existing panels, conditions the wavelengths of photons as they hit the solar cells, providing a significant boost to solar power generation. The Photonic Solar Conversion (PSC) coating enhances the solar output by 20+% on per panel basis and allows for larger peak-loads, meaning fewer panels are required to meet the same demand. The effect of PSC technology is a significant reduction in the levelized cost of energy (LCOE) caused by the reduction the $/watt dc on per panel basis, as well as reduced balance-of-the-system (BOS) cost. Figure 3 shows the spilt of the module cost, BOS cost and the inverter cost and expected reduction for 2018 (GTM research). The reduction in the $/Watt dc (33cents/watt) for each module by 20% and equivalent reduction in BOS (49cents/watt) will significantly reduce time ROI payback period from 15 years to 9 years. Most solar systems expect a 25-year lifespan with power purchase agreements for 25 years; all sectors of solar PV installations – residential, commercial, industrial and utility scale—will benefit from Photonic Solar Conversion technology, which promises to revolutionize the solar industry. 100 William T Morrissey Blvd.